Red Heart Shape And Medical Stethoscope On Blue Background Top View. Health Care, Medicare And Cardiology Concept. 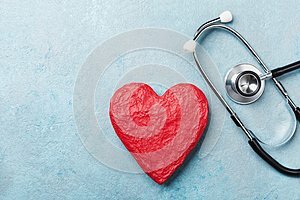 Photo title: Red heart shape and medical stethoscope on blue background top view. Health care, medicare and cardiology concept. Red heart shape and medical stethoscope on light background top view. Health care, medicare and cardiology concept.